JEFFERSON CITY – “Paul: Apostle of Christ” is tastefully acted, nuanced, possesses decent production values and – most crucially – is biblically sound. That right there sets it up to be better than most “Bible” or “Christian” movies these days. I’m just not sure that makes it a good movie. 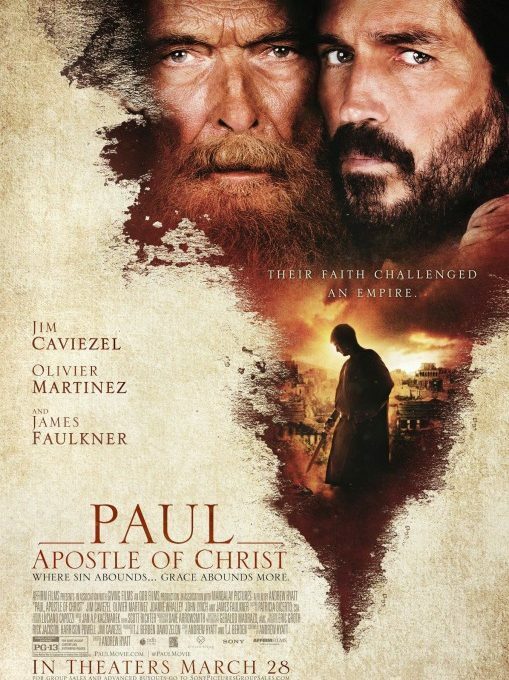 The movie covers Paul’s last days while he is a prisoner in Rome. Played by British actor James Faulkner (“Downton Abbey”), he is tired and near the end of his life and ministry. Yet, he remains steadfast in his dedication to the Lord Jesus and to encouraging and strengthening the Church. Luke, stoically played by Jim Caviezel (“Passion of the Christ”), sneaks into Paul’s prison cell in order to produce a hand-written account of Paul’s life and ministry, the notes that would eventually become much of the fifth book of the New Testament. The movie does take some license with the Biblical account, but nothing too drastic that compromising the meaning or message. Paul is haunted by those he persecuted. Aquila and Priscilla are shifted to Rome as the leaders of the underground church, hiding from Emperor Nero. There’s a subplot of a conflicted Roman jailer (Frenchman Olivier Martinez, with an accent so thick I had a hard time following his dialog) and his dying daughter who is in need of Luke’s medical care. We also see Paul’s death by execution, a fate not found in Scripture, but held by tradition. There is some fun to be had listening to Paul utter the words that were soon to become Scripture. Paul repeats many passages from his previous letters to the congregations of the early Church as Luke transcribes the history of spreading Christ’s gospel. It’s also refreshing to see a movie that is confident enough in that gospel that it doesn’t have to hammer home its point over and over again (“I Can Only Imagine” does this as well, but in a totally different way). Still, I can’t help but think the filmmakers chose one of the least interesting biblical stories to tell. Paul’s life is an exciting one full of travel, violence, grace and miracles. It’s just a shame this movie focuses on the most boring segments of his remarkable life and ministry. I didn’t fall asleep, but it was a distinct possibility. We get (very) brief flashbacks of the stoning of Stephen and Paul’s salvation encounter on the Road to Damascus, but these are too short and only serve to remind us how plodding the rest of the movie is. If anything, this is Luke’s movie, not Paul’s, but his story isn’t any more exciting, which is almost impressive given that he is breaking into a prison. In his second letter to Timothy, Paul himself wrote that “all Scripture is inspired by God and is profitable for teaching, for rebuking, for correcting, for training in righteousness.” Notice that he didn’t say that all Scripture is automatically a good basis for a movie script.